Dental implants are a wonderful type of treatment for anyone that has lost one, or even multiple, teeth. The reason that dental implants are so useful is that they can completely restore the functionality of your mouth. With a properly designed and fitted dental implant, once again, you’ll be able to chew and smile with complete confidence. You would be surprised by just how much your mouth and teeth can be affected by the loss of a tooth. Apart from leaving a very big hole, your teeth that are next door to the hole, may be severely negatively affected; they are highly likely to move into the wrong, or an awkward position, and are much more prone to decay, plaque, tartar, chipping and even cracking. 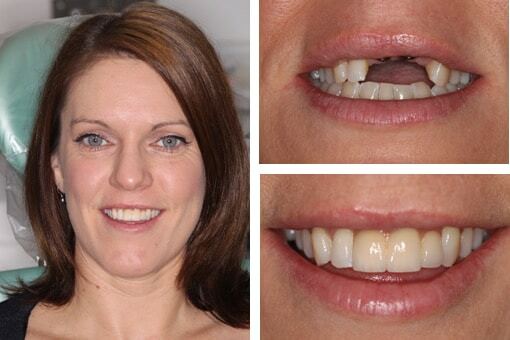 Dental teeth implants are a very permanent and effective answer to a missing tooth. By inserting a custom-made tooth, attached to a metal post that is surgically implanted in your jaw, you regain full function of your mouth. The post actually grows into your bone, becoming an anchor for your custom-made tooth. Dental implants have a very high success rate. 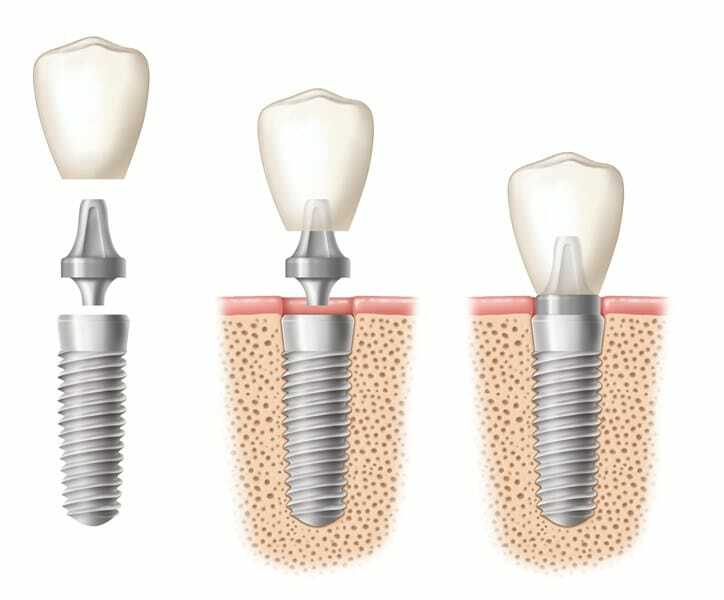 Unlike some other procedure types, implants actually feel, look and work just like your real, original teeth. Best of all, with the proper care and maintenance, your dental implants can event last a lifetime. They are not prone to decay or plaque or tartar build-up like real teeth. They help to prevent side effects associated with tooth loss including bone loss, gum problems and, in some instances, even difficulties talking. Implants restore full functionality to your mouth—chewing and full strength to your bite. 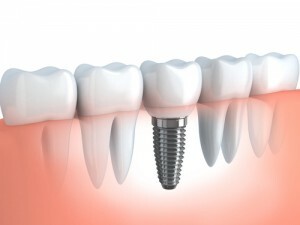 Dental implants are both convenient and quite comfortable. There is no invasive treatment of your other teeth required (as there is with bridges and crowns). To fit implants, we will not have to grind down your teeth. With dental implants, you won’t need to have dentures, which can be annoying—they slip around and require the use of messy adhesives. First visit: we will undertake an in-depth evaluation of the existing state of the health of your bones and gums to determine whether you are eligible to have implants. If we determine you can have implants, then we discuss the entire process with you in minute detail. Second visit: during this visit, you will have any remnants of your original tooth removed. We will, of course, give you an anaesthetic and ensure that you are completely numb and pain-free throughout the procedure. Once this is complete, we will affix the actual implant, which looks almost like a very small screw. This goes directly into your jawbone. Once installed, it will actually grow in unison with your jaw, so that the two become one. 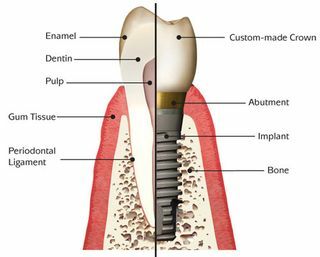 Third visit: when you are completely healed from the implant, we will attach the crown or bridge to the top. This is the part that actually looks like your tooth. Again, you will be completely numb throughout this procedure. Once complete, you are all set and can enjoy your new tooth!